Logan Sabins tracks his shot at the Butler Fall Invitational last season. 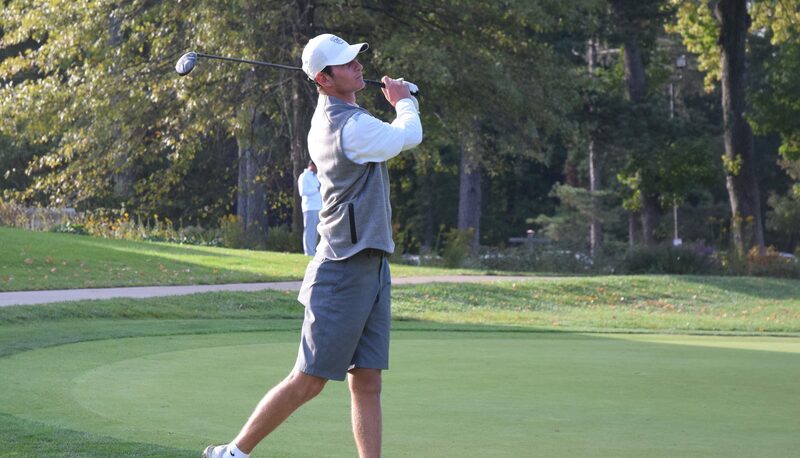 Sabins and the Butler men’s golf team finished eighth in their final fall competition from Oct. 22-23. Collegian file photo. The Butler University women’s golf team finished seventh out of 13 teams at the Charles Braun Jr. Intercollegiate from Oct. 22-23. Senior Lauren Tibbets finished fifth in the tournament with a score of 154 (+10). On Monday, Tibbets carded a 78 (+6). Her round of 76 on Tuesday propelled her from a tie at eighth place to her fifth place finish. Ally Ross improved by seven strokes between her two rounds. Ross finished in a tie for 17th with a score of 161. Betsy Werner, Allison Kinsinger and Claire Edwards also competed on Butler’s team and Nicole Jordan played as an individual. The Butler University men’s golf team, meanwhile, finished eighth out of 13 teams at the Musketeer Classic in Cincinnati, Ohio from Oct. 22-23. Senior Zack Carrabine lead the Bulldogs scoring a 220 (+7) to finish in a tie for 16th. Carrabine, Michael Cascino, Patrick Allgeier and Logan Sabins finished one shot behind each other carding 220, 221, 222 and 223, respectively. Cascino finished in a tie for 23rd. Allgeier finished in a tie for 27th with his score of 222 (+9). Sabins tied for 32nd in the tournament carding a 72 in his final round. Michael Denner also competed for the team finishing in 81st with a score of 242. Ricky Kuiper played as an individual and scored 234 to finish in a tie for 68th. This was the final competition of the fall for both teams. The women will return to action in February at the Edwin Watts Kiawah Island Classic. The men’s next competition will be the Invitational at Savannah Harbor, also in February.